Kaduna State Governor Nasir Ahmad El-Rufai has presented the draft 2017 budget to the state House of Assembly. The governor said the budget size is set at N215bn because the tough economic times call for an expansionary budget to drive recovery and end the recession. In his remarks to at the budget presentation, El-Rufai explained that the budget is split in a 60:40 ratio in favour of capital expenditure. 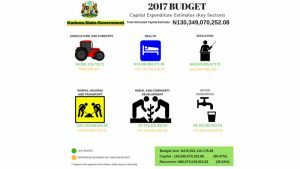 “The size of the proposed 2017 Budget is N215,921,110,176.68, including N85,572,039,923.82 of Recurrent Expenditure and N130,349,070,252.86 in Capital Expenditure. “This is a significantly larger budget size than the N189.9bn we initially considered. We presented the draft estimates for discussion through consultations with the private sector, civil society and, finally to the general public, at a town hall meeting. “The outcome of these consultations convinced us that we had to be even bolder in proposing an expansionary budget in these difficult economic times. We are convinced that the pursuit of economic recovery must now be a national focus. Even with the limited influence any of the 36 states can alone exert on our national economic fortune, we can encourage some buoyancy in each of our states and collectively support the effort of the Federal Government to secure economic recovery. Moments of recession have an outsized adverse effect on the most vulnerable and we must not let it persist. Details of the budget indicate that Education (N43.976bn), Health (N10.39bn), Water (N8.1bn), Infrastructure (N24.50bn) and Agriculture (N4.58bn) take the chunk of the capital budget as the state continues to invest in its pro-poor programmes and to provide the facilities, laws and policies to attract the investments that create jobs. Implementation of an Emergency Nutrition Intervention Programme to reduce malnutrition and hunger amongst our poorest citizens and children. Explaining further why the Kaduna State has made its budget choices, the governor said that it about jobs, social justice and equity. “We are laying before the House of Assembly today draft 2017 estimates that are actuated by the conviction that tough times call for bold decisions and courageous actions. That is why we propose to spend at least N15bn on roads alone. To rebuild schools, we are asking for N20bn this year and for each of the other two years captured in the multiyear budget making a total of N60bn. “Such is the scale of the educational crisis we inherited that we have concluded that a programme of school rehabilitation will not suffice. What we need to do is to rebuild schools altogether to solve immediate problems and create capacity to absorb the predicted increase in the number of school pupils over the next decade. “The government is taking on debt to fund productive investments to expand our economy, grow our revenue base and build the human capital of tomorrow. Without such investments in physical infrastructure and human resources, we will attain neither the desired standards of economic growth, nor realise the IGR levels we so badly need. We have decided that the imperatives of the future demand that we break out of the cycle of under-investment that has stymied the state over close to two decades.